Somehow I managed to go a year without posting to this space. Sure there are a million excuses (new job, no time, long commute) but really, I just didn’t want to blog anymore. It was just too much to take the perfect picture to get onto Tastespotting or Foodgawker (which ironically, I never visit anymore), try to say something witty and meaningful and keep up regular posting. So I just stopped. But now I’m realizing that I have a years worth of recipes I’ve tried out with no documentation. 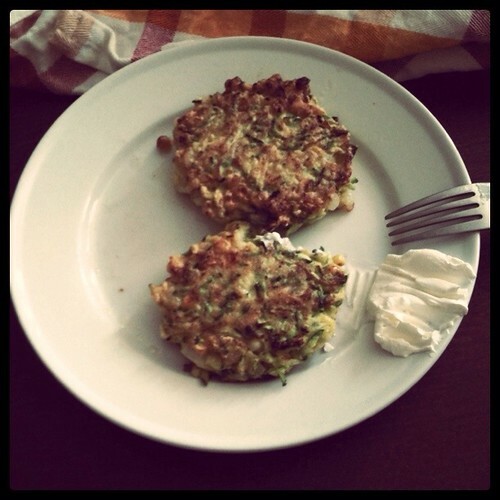 Take these Zucchini Corn Fritters. I made them last year around this time. I know this because the picture was still on my iPhone. 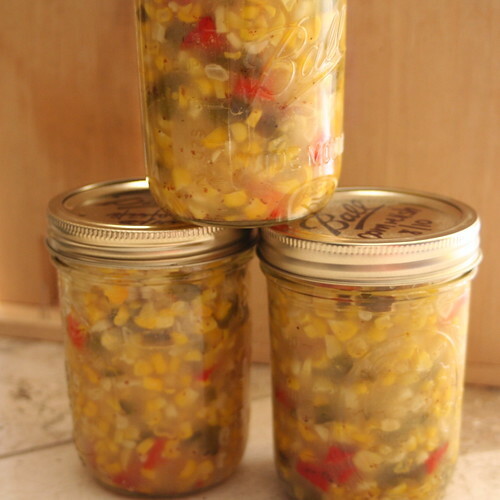 Once again, I am overrun with zucchini from my CSA share and corn just hit the market, so I went to my blog to find this recipe and I realized, it wasn’t there. Thankfully, some searching with Betsy of our GChat histories allowed us to find this recipe. So, I have no idea how often I will make it back to this space. But I’m going to try to start posting again, mostly just for me, my family and my friends so that I can remember the highlights in my kitchen. But if you happen to still be reading after all this time…all the better. 1) Shred the zucchini on the large holes of a box grater or with the shredding disc of a food processor. I used the food processor. Place the shredded zucchini in a colander in the sink or over a bowl and sprinkle with the salt. Toss to combine. Let drain while you get the rest of the recipe ready. 2) Crack the eggs into a large bowl and give them a quick scramble with a fork. Cut the kernels from the cob using this method and add the kernels to the bowl along with the onion, scallions, cilantro, chives, flour and pepper. 3) Grab the shredded zucchini in small fistfuls and squeeze out as much water as possible over the sink. You want to get out as much liquid as you can. Add the zucchini to the bowl and mix well to combine. 4) Pour the oil in a large frying pan to a depth of about 1/4 inch. Heat the oil over medium-high heat until not but not smoking. 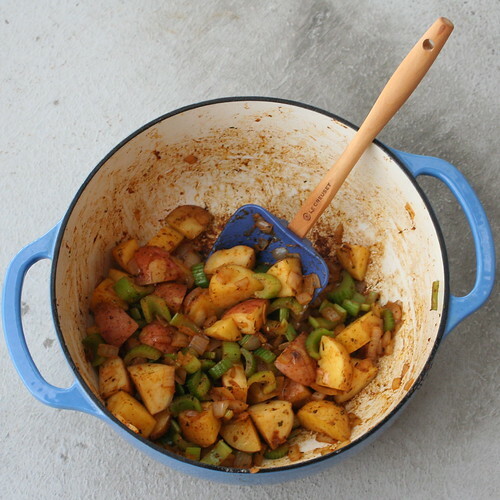 Drop a handful of the zucchini mixture into the pan and press down with a spatula to form a disc. Cook in batches without crowding 2-4 minutes on each side. You want the side to be golden brown. Remove to paper towels on a plate to drain. You may need to add some more oil between the batches. 5) Serve with some sour cream on the side. The fritters should be crisp on the outside and slightly custardy on the inside. I have one of my best friends to thank for this dip (Hey Ashley!!). During college when we were both living in the sorority house, we spent a Friday night in, chopping and stirring away, making a big bowl of this dip. Then sitting on her floor (she was President at the time so she got her own room), with tortilla chips or even a fork and eating away. Since moving to Chicago, I have made this dip for every Superbowl party and it has not disappointed. 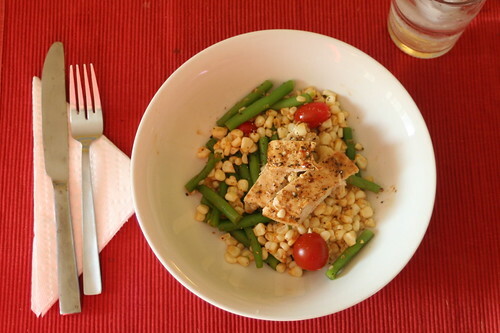 The beans, avocado and corn is a nice change from all the other greasy, fried goodness on the table. Last night my friends Brian and Julia had us over to watch the game and prepare WAY too much food that could be reasonably consumed by 4-6 people. I brought the Dip (recipe below) and made Bakerella’s famous Cake Balls by request (had to use yellow cake mix because red velvet was unavailable at two stores and I was too busy this weekend to make it from scratch). I also tried to class up queso by using Homesick Texan’s method. It was tasty but I wish I could have found “Longhorn Cheddar” because I think I used a little too much Monterrey Jack. It was reminiscent of PW’s Spicy Mac and Cheese, which of course is not a bad thing. But the Dip is really something special. I wish I could have gotten this posted before the Super Bowl but it really is great for any party, picnic or potluck. It is sure to impress. Mix everything together. Don’t stir too hard so that the avocado stays somewhat in pieces. Serve chilled with tortilla chips. Or even just a fork. Well…I haven’t fully found the time to really get this blog started but since I enjoy other blogs so much, I will try to make a better effort. 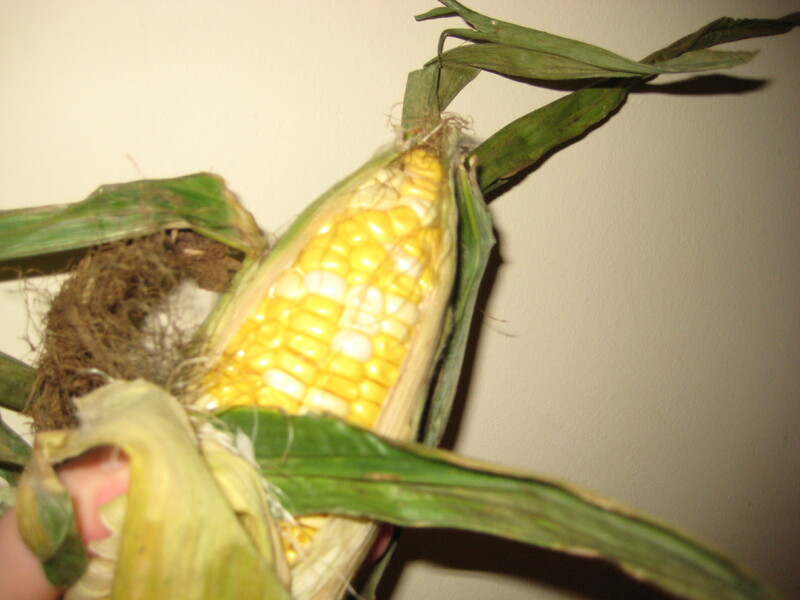 I have really been enjoying all of the amazing finds at the Green City Market, in particular…Corn. I can’t go to the market without buying the 5 ears for $2 from Nichols Farm. 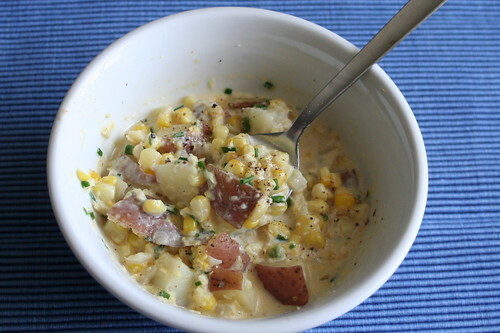 Dave and I have been eating them off the cobb and I have made Kristen’s Corn Chowder to freeze for quick dinners more than a few times. One Saturday morning at Green City, the Chef (sadly the recipe doesn’t say who or which restaurant this came from) were sampling Corn Pancakes. The are kinda a mix between sweet cornbread and a thin pancake/crepe. Really great for a weekend morning. They are even good leftover and just nuked a bit to warm them back up. I hope you enjoy. Fresh Corn Pancakes (makes 16-4in. cakes)-from Green City Market’s Cooking Demonstration. Honey for serving (I don’t like Honey but Dave enjoyed this). In a small box, whisk together the buttermilk, eggs and butter. In a larger bowl, whisk together the flour, cornmeal, sugar, baking soda and salt to blend. Add the wet ingredients to the dry and stir until just combined (there will still be lumps). Gently fold in the corn kernels. Spray a skillet with cooking spray (I tried to melt some butter but the cooking spray really works better for this) and heat it over medium heat. 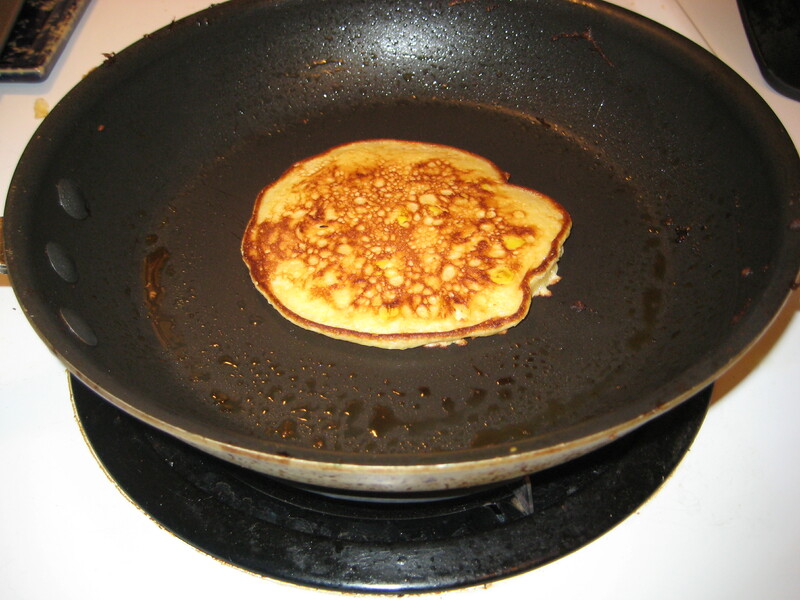 Pour 1/4 cup of batter on the griddle and let its spread in a circle. When the bubbles break on the top, flip the pancake. This should take 1-3 mins. (I had trouble flipping a few and I realized I was flipping just a tad too early-make sure there are a decent amount of popped bubbles on the top). You can stick a cookie sheet in the oven on warm to keep the pancakes warm while you finish cooking the rest. Serve with the honey, or a little butter, or just plain. Enjoy!